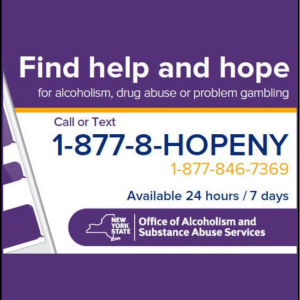 The NYS HOPEline is a telephone support and referral line that is available 24 hours a day, seven days a week. Trained masters level clinicians are available to answer your questions and help find you problem gambling treatment and/ or self-help in your area. Whether you are struggling with gambling, alcohol, drugs or suicide, anonymous and confidential support is available. Call the toll-free OASAS HOPEline at 1-877-846-7369. All calls are confidential. Hesitant to pick up the phone? Don’t be! The operators at the HOPEline are friendly and dedicated to helping you find support. When you call the operator will simply ask how they can help. If you are looking for services they will need to know your zip code so they can locate the closest treatment provider to you. The operator will also ask if you would like the contact information for self-help supports.